Now that Instagram video has officially launched we’ve all heard the, in my opinion, hasty comments such as…”Vine is dead.” We’ve even seen the memes! But is it really? What makes Instagram video any better? Or worse? Or does it matter at all? One of the most obvious differences is the video length. 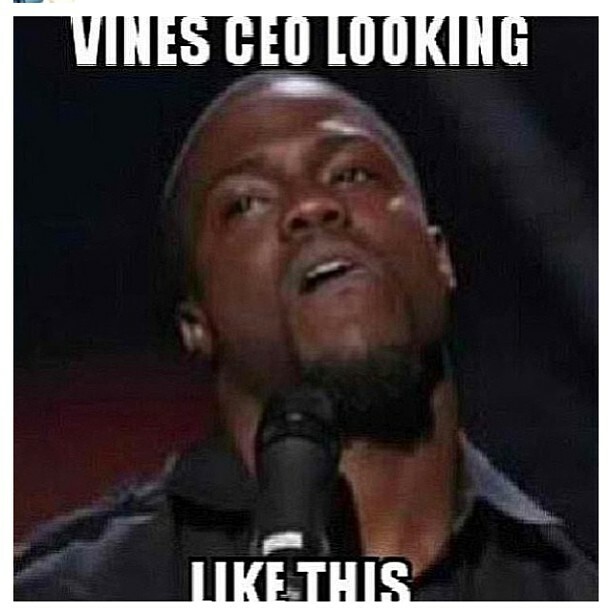 Vine, as we all know, limits videos to 6 seconds. Instagram’s new video function allows for 15 seconds. To the average user, this may seem like an improvement, and it can be argued as such. There’s much more room to get your message across, however, for the creative niche that Vine first acquired at its launch this isn’t a good deal. The 6 second limit allows for immense creativity when creating a Vine. When you create a super interesting, ridiculously creative video in 6 seconds it’s amazing. With 15 seconds isn’t it a tad less amazing? Also, let’s not only look at this from the creator’s view. From the consumer’s point of view 15 seconds might be too long. When it comes to social media our attention spans shorten every day! The next notable difference are the Instagram video filters. Okay, okay, I cannot pretend that Instagram didn’t sell me with this one. I love filters and quite frankly so do most people with smart phones. The ability to make my videos that much more aesthetically pleasing makes me lean toward Instagram video a little more. One of my favorite functions on Instagram video that Vine lacks is the ability to delete your last clip. I’m no film major and certainly no video expert in any way. I mess up A LOT when I’m trying to make my videos as cool as possible. It did indeed frustrate me when I had to start all over because my fraction of a second clip on Vine wasn’t exactly what I wanted. Instagram video gets a +1 for this addition! Something less notable that I’ve noticed is that Instagram videos take a while to start playing while Vine videos play pretty much automatically. Not sure if it’s just my phone but I’d love to hear your thoughts. Last but not least, Vine videos are embeddable! This is a big plus for people who want to post their videos on their websites or blogs for example. I’m not seeing this happen anytime soon for Instagram video. Neither are ideal for me though, but I guess I’m a little picky. Drafts! Especially from a social media manager’s perspective. It’s hard to get these things approved when your client isn’t down the hall. During my fall internship at Converseon, Inc. I created a PowerPoint deck that covers Social TV on mobile devices and provided some great best practice examples for you all to take a look at. I’ve provided the link to my Scribd page at the top of this post but if you prefer SlideShare check it out HERE. What do you think lies in the future of Social TV? 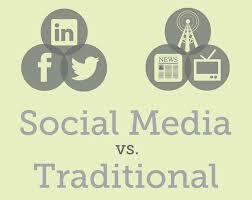 In a previous post, I told you all to stay tuned for my paper on social media vs traditional marketing. The time you’ve been waiting for is finally here! The paper is about ten pages of reading so I’ll post the intro here and let you decide if you’re interested. Let me know what you think! When the average person thinks of marketing, they think of advertising and promotions, but there’s much more to it than that. According to the American Marketing Association, marketing creates, communicates, delivers and exchanges offerings that have value for users, partners and society. Marketing can be a commercial, a press release or even a Twitter account. Marketing is more complex than many people know and with the rise of the internet that complexity has increased greatly. The internet has broadened the marketing spectrum to internet marketing, which in turn includes subsections such as email marketing, search engine marketing and social media marketing. In this paper, I will discuss the differences and similarities of traditional marketing and social media marketing as well as how they can be used together. I will explore real life business cases to show the importance of social media marketing today, and how traditional marketing still plays a major role in reaching consumers. As the holiday season continues, most of us think about shopping! Well, some people who are more like me think about it all year round. While on one of my many shopping trips (window shopping for now), I thought of something cool: a social shopping app. How would my social shopping app work? While shopping, you’d be able to take pictures of what you tried on or what you are thinking of buying and upload the picture (in an Instagram format maybe?). This will broadcast the picture to all of your friends, or friends you select, along with price, discounts, sizes available, colors available and any other relevant information. With this information your friends can then reply, “Try it in a size smaller,” “I think mom would like the blue one better,” “$59.99!? That’s too expensive for a polyester t-shirt,” and anything else to help your purchasing decision. As you probably know, last week the east coast faced one of the most devastating storms we’ve seen, Hurricane Sandy. I live in Brooklyn, New York and throughout all the boroughs, our transportation system, the MTA was shut down. Little by little the trains and busses have been put back into action, but due to the suspensions, Baruch College and most other schools were closed. Of course on that day, Baruch College Facebook pages and groups flooded with complaints including work obligations, travel inconveniences, religious obligations and much more. How do they expect every student to be available on these days? After all, we set up our schedules for certain days and times for a reason. But we have to get the amount of education we paid for right? So what’s the solution? NEW MEDIA! There are many new media options we can use to overcome this problem. In my opinion, a couple of online lessons would be a great alternative to coming in on the extra days listed. Professors can utilize our class organization platform, Blackboard, to post YouTube video lectures, assigned readings and use the discussion board function for class participation. 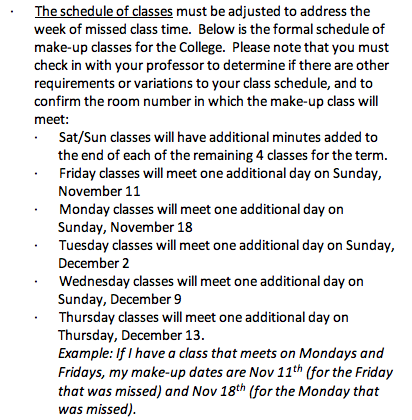 This way, we will be provided with the information we would have learned in class and interact with the professor and other students, essentially gaining the same knowledge we would receive in person, while preventing the interruption of our previously scheduled obligations. What ideas do you think would help? New media has certainly made things far more convenient and efficient, but nothing’s perfect and new media is no exception. One of the major issues that comes with the rise of the internet in particular is privacy and confidentiality. Some agree that it may be TOO easy to share information, files and ideas online. One of the major mediums where copyright issues are prevalent is YouTube.com, especially within the music industry. According to the New York Times, many amateur musicians upload videos of themselves singing or playing songs that are owned by big corporations. These corporations often force these videos to be taken down due to licensing issues, aggravating fans and others, but helping to implement the law. Another industry where this is an issue is image sharing. For example, Pinterest, a virtual pinboard that lets you share images you find interesting online, is constantly criticized for their lack of copyright law implementation. Many companies complain about people sharing images on their profiles, many gaining tons of likes and shares, but nothing linking back to the source. How do we resolve these issues? Some say we should crack down on violators, and others say we should become more flexible with the laws. One solution is to have a site that allows owners to share things that they don’t mind other people sharing, with the rules spelled out in plain english. One example of this is Creative Commons. The common consumer also faces privacy problems. Many consumers are concerned that their email addresses and other information are being shared without their permission through social networks, companies sharing and buying email lists, etc. What solutions do you think will help solve these problems? When it comes to storytelling, which is already a creative process, it doesn’t get any more creative than this. Imagine a place where hundreds of people can create one story together, fostered by new media technology. Yes, this place exists, at Qwikstory.com. Similar to a “giant game of telephone,” as Mashable puts it, a user begins the story with 1000 words or less and any other user can continue the story. Qwikstory is collaborative, team oriented and also fun! It’s a unique spin off of traditional social media like Facebook and Twitter, mostly because of the creativity and uniqueness involved in how one participates. In my opinion, this site has much potential for being used in education and business. My favorite thing about it, besides the fact that it’s fun and easy, is that when you go to read a story, it actually looks like a storybook, online!